Living in the city centre you sometimes get lazy. With everything on your doorstep, why travel to get anything? I mean, occasionally we’ll make a proper journey up into Northumberland for a Sunday roast or similar but we very rarely drive to, say, Heaton for culinary treats. Then I started hearing the rumours about a new joint, one serving mouthwatering Brooklyn style pizza pies, having moved in just out of my jurisdiction. I paid scant attention until suddenly those rumours are EVERYWHERE. When somewhere’s consistently being voted Best Pizza in the North East it’s hard not to listen. Cue a snazzy invite to the Cal’s Own one year birthday party! Yes, they’re been open a whole year and I’ve not been. You’re disappointed in me, I know. But not as disappointed as I am in myself. And let me tell you that each pizza the kitchen brought out was better than the last. Divine. And you don’t need to just take my word for it. Among other NE food writers I spotted local culinary hero Terry Laybourne, taking a break from ruling Cafe21 to sample a slice or several of Cal’s cooking too. 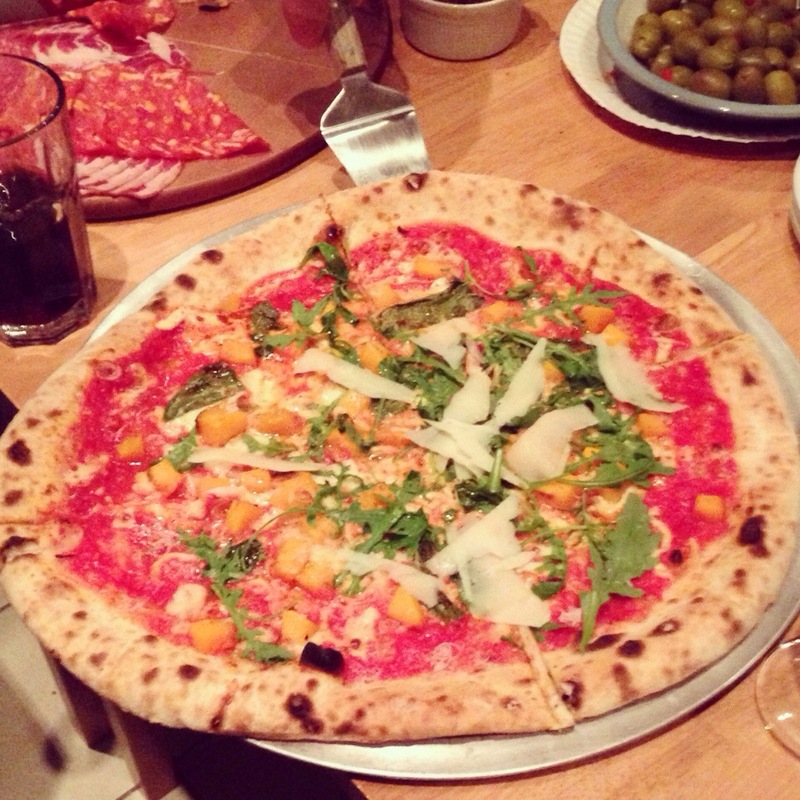 Pizza perfection, atmosphere and service with a smile; what more could a girl ask for? Perhaps wine? Well, you can pop into a shop en route and BYO favourite tipple for the inoffensive corkage fee of £1 per person. Warm the ovens up Cal, I’ll be seeing you again soon. Here’s the usual babble: Yes, this evening was provided FOC for review (and celebratory!) purposes but every word of this post is the truth, the whole truth and nowt but the truth. MASSIVE thanks to Cal, his hardworking staff and Scran on the Tyne for the invite. Once again please accept my apologies for the shoddy photos. I know I need to get a decent camera, but you get the idea. Credit to the pro Hannah Layford for letting me use the better quality pizza picture featured at the very top of the page. Because she’s apparently much better at this lark than I am.